- BD Alcohol Swabs ensure reliable site preparation for safe, hygienic insulin injections. 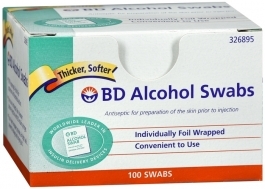 - BD Alcohol Swabs are also excellent for many other household uses. - 70% Isopropyl Alcohol for optimum anti-bacterial action. - Use an antiseptic skin cleanser before injection with B-D insulin syringes. - Exclusive four-layer wrapper provides air-tight seal...prevent leakage and drying out. For the preparation of the skin prior to injection to decrease germs in minor cuts and scrapes. - Do not apply on irritated skin. - Do not use in the eyes, or on mucous membranes. In case of deep or puncture wounds, consult a doctor.